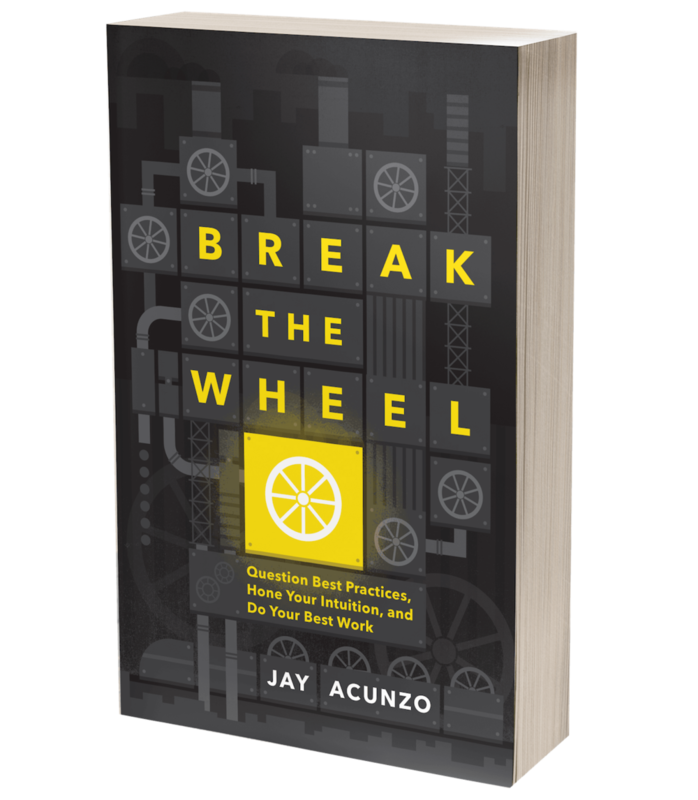 Unusual Content Marketer Interview Questions That Just Plain Work — Jay Acunzo | Author. Speaker. Maker of Shows About Work. As I've told each of them ad nauseum, I am eternally grateful for the chance to have worked with them. Plus, they made me look really smart, when I actually got really lucky. At best, these are passable. In reality, these are crap. And you don't want to hire a crap content producer and marketer. You want the Eriks and Jeffs. You want the best. But you're doing it wrong. I know this because I was doing it wrong, and I was doing it wrong because I was trying to figure out the "best practice" rather than come up with something more unique and effective. What to ask: This happens before any phone or in-person interview. In the job description, I like to bury a line of copy that reads, "Attention to detail test: Use the word 'transform' somewhere in your application." I may change the word, but I always use this and always bury it deep inside the job req. What you're trying to learn: As the name implies, you're looking to catch who has great attention to detail -- a massively important trait that can be tough to test and tease out of an individual. (And the answer is yes, I do immediately remove candidates who miss it. If you can't pay attention to this one, relatively obvious detail while trying to land the job -- ostensibly, one of the more important projects you'll undertake -- then how can you be expected to be a great content marketer? There are simply too many moving parts to this job, too many inputs, and too many details flying everywhere on a single project or overall strategy NOT to be detail oriented). As a byproduct, I find that people with high attention to detail are often the most creative. This is because (again, painting in broad strokes here) people with high EQ and self-awareness tend to make great creatives. They are empathetic. They notice the little things, both in what makes others tick and in what small decisions amount to a successful project. A great potential answer: Someone who goes one step beyond simply inserting the word as a synonym. An acceptable answer is to say something like, "I believe this job can transform my skills." Again, that's fine. They've passed the test. But it's very "letter of the law." A truly great answer would be something more creative, perhaps where they deconstruct what that word means to them or tell a story where that word appears naturally in the flow of things. The very best example of using this word in an application was in a video cover letter someone once submitted to me while I was at HubSpot. As they spoke, they paused the screen on a giant, all-caps "TRANSFORM" and used a pregnant pause, then audibly cleared their throat. Then the video continued. Brilliant! What to ask: "If we were producing a podcast and you joined the team, would you be most excited to host the show, produce the show, or distribute and promote the show?" What you're trying to learn: This is not about the actual project of creating a podcast. Instead, you're trying to learn where they fall on the insanely broad spectrum of content marketing tasks and traits needed to be effective. What gets them excited? How might their skills or passion areas complement you or your team? Do they lean towards the content creation side or the distribution and measurement side of our world? Are they the chef? Do they want to build the kitchen? Or do they want to get butts in the seats? (In other words, do they prefer to be a front end or back end content marketer?.) This changes how they might complement you and your team, as well as how you might be an effective leader and coach for them. What to ask: If I handed you a bag of money today and you therefore didn't need to work for two years, but to receive this money, you HAD to write a blog, what would you write about? What you're trying to learn: Who are they as a person? Do they stammer and stutter and default to a mundane business topic? If so, they may be a limited candidate that hits a ceiling quickly, because they appear lack drive and passion outside of the job description's bullets. (At Google, we talked about trying to hire "mental athletes" to be not only great at the job but flexible and strong enough to move with the crazy rate of change in our industry.) Do they ramble on and on about something seemingly irrelevant? Then you've got a great window into who they are and how they think. You're also able to learn whether they'll be a great producer of content or not. The word here is INTRINSIC. Are they intrinsically motivated to write and create? If not, you may have your hands full. You can more easily train a writer to market well than a marketer to write well. The former is a skill most of us pick up in a matter of quarters on the job, at least to some proficient level. The latter -- the ability to write -- is an amalgam of your life experiences, your interests and mental inputs, and many years' experience actually writing. A great potential answer: It doesn't matter WHAT they say. It matters HOW they say it. You want someone to absolutely light up as they give you their answer. You can dig further by asking how often they'd write or what else they might create besides text articles, if need be. But you don't want someone to say they'd sit on a beach somewhere, write once a month, and write about something that rhymes with the job for which they're interviewing. What to ask: What's something atypical or clever you've done in the past to create something or distribute something? NextView partner Rob Go recently wrote a post that speaks to this as well: What Makes a Great Consumer Marketer? In it, he describes this ability some marketers have to take risks and take advantage of new systems and channels and tech as they all emerge, before they get satured. A letter of the law (or peace time) marketer will simply do what marketers are "supposed" to do, in ways they're supposed to be doing them. They'll buy Facebook ads. They'll buy AdWords. They'll blog. They'll capture subscribers. Then there's that mad scientist or spirit of the law or war time marketer. (I have an English Lit degree; I only get a return on that investment by using metaphors, okay?) These people will keep both their customers and their company goals in mind and do whatever it takes to find them and yield results. They'll use new, emerging channels in atypical ways. They'll do scrappy, non-scalable things. And, yes, they'll use the regular array of channels, but they'll find creative ways to produce results. I once talked to the CEO of a startup who had a rigorous process for testing dozens of variations of the creative on Facebook in a low-dollar way, rule out the dogs, bet big on the winner, while also reworking the headline of the original blog post. He'd then promote that blog post (ostensibly as well-optimized for his audience as it could be) more broadly. No matter how much some companies and executives wish we could automate content creation and marketing from start to finish, this is a profoundly people-driven form of marketing. It's tougher to scale in the sense that you can't simply plug in some tech and keep your hands off the wheel for awhile. Bottom line: The robots haven't replaced the writers. And if you hope to hire great writers -- or great content producers, marketers, and leaders -- you have to be able to uncover whether they're great in the first place. Posted on July 31, 2015 by Jay Acunzo.